Major Geoffrey Dennis Browne (Royal Field Artillery) is killed in action at age 28. He is the son of the Reverend Ernest Alfred Browne. Captain John Deighton (Royal Army Medical Corps attached Royal Lancaster Regiment) dies of wounds at age 29. His brother was killed last July. Captain Hugh Christopher Tower (Royal Flying Corps) is killed over Grevillers Wood when shot down by Oswalde Boelcke at age 30. His brother was killed in October 1915. 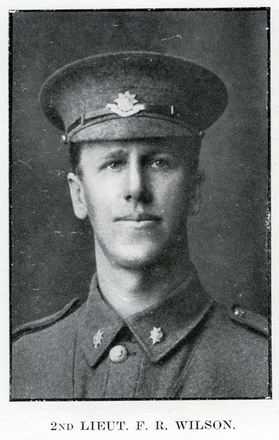 Second Lieutenant Frank Reginald Wilson (Auckland Regiment) is killed at age 31. He is a former New Zealand International Rugby Football player for the All Blacks. Lance Sergeant Lennox Fraser Robertson (British Columbia Regiment) dies of wounds at home. He is the son of the Reverend R Robertson. Private John Henry Robinson (Yorkshire Regiment) dies of wounds at age 19. His brother was killed in August 1915 on Gallipoli. Private Robert Smith (Durham Light Infantry) dies of wounds at age 22. His brothers will be killed in the Great War over the next year. Rifleman Douglas Alexander McKay Shephered (London Regiment) is killed at age 25. He is the son of the Reverend Canon William Mutrie Shepherd. Private George Long (Cheshire Regiment) dies of wounds at age 21. He is the first of three brothers who are killed in the war.